Shiver Me Timbers Pirate Booty Can Be Found On Wii U! Developed and published by Wildmane Studios Chests O' Booty is a match five style puzzler that will shiver your timbers, but is it worth its cost to download? Well if you want to know the answer to that question then continue reading the rest of our review of the game! 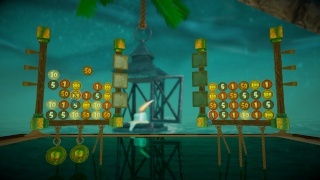 The game features several modes including an endless casual and a more traditional timed mode as well as a versus mode. The casual mode is very flawed as there is absolutely no way to lose as there will always be matches to utilize and timed mode is equally flawed as you are only given a time limit of 40 seconds which doesn't give you enough time to really enjoy each round. Versus is a decent multiplayer mode that is fun and will distract players from the other two modes, but it isn't enough to save the game. As for the gameplay itself you must match up five of any adjoining like numbered coins to clear them from the board. 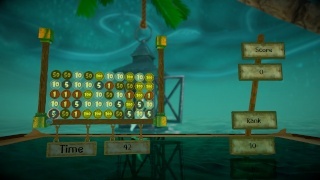 Timed mode adds the danger of bombs which will destroy large areas of coins at the top of the board. Overall the gameplay is simply to simple for its own good. The controls are easy to learn and even easier to master which doesn't do this already overly simplistic game any favors. The graphics are also quite lackluster and dull while the music is fitting there's just not enough variety to really enjoy with just one song available. With lackluster visuals and overly simplistic gameplay and controls Chests O' Booty just isn't a game we can recommend, and though the music is fitting the game only has one track which gets old after awhile. The versus mode is decent, however it's not enough to save this game from mediocrity or from receiving a neutral recommendation from us. This game shall make grown men weep at its pathetic existence.